Wild About Ewing! is extremely excited to announce that they will sponsor Part II of an introductory series to the National Wildlife Federation’s Community Wildlife Habitat Project and how gardeners in Ewing are providing much needed wildlife habitat while getting credit for both themselves and their community at the Ewing Branch Library, 61 Scotch Road, Ewing on Monday, March 25th at 7 pm. 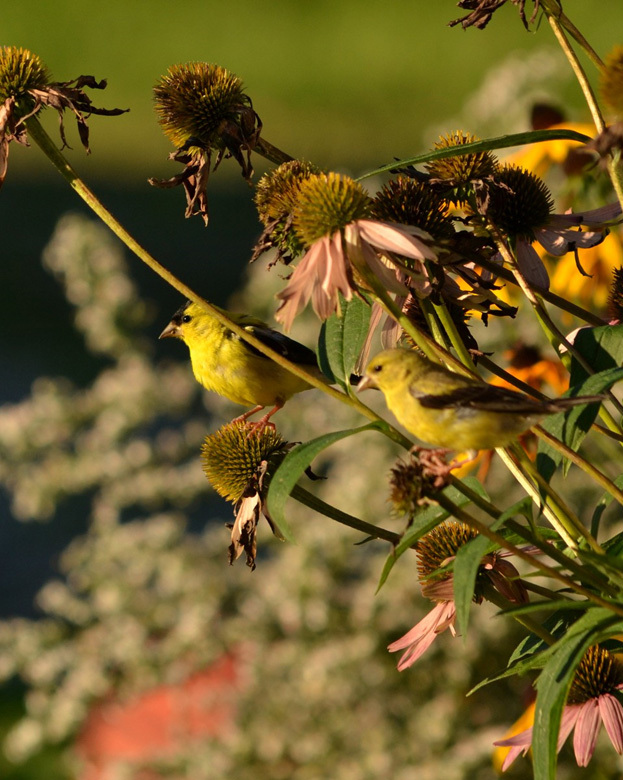 Mary Anne Borge, a local naturalist, writer, photographer and educator, will tell you what you can you do to attract birds to your garden and which plants are best to entice bees, butterflies and other beneficial insects to make their homes with you. She will also share maintenance techniques that are the most hospitable for these garden visitors and residents. Mary Anne Borge is a naturalist, writer, photographer, and educator. She is the Associate Editor for Butterfly Gardener magazine, a publication of the North American Butterfly Association; an instructor and naturalist at Bowman’s Hill Wildflower Preserve in New Hope, Pennsylvania; a Pennsylvania Master Naturalist, and the team leader for Lambertville Goes Wild. Her photographs have been featured in numerous publications. She shares her love of nature through her writing and photography at the-natural-web.org. 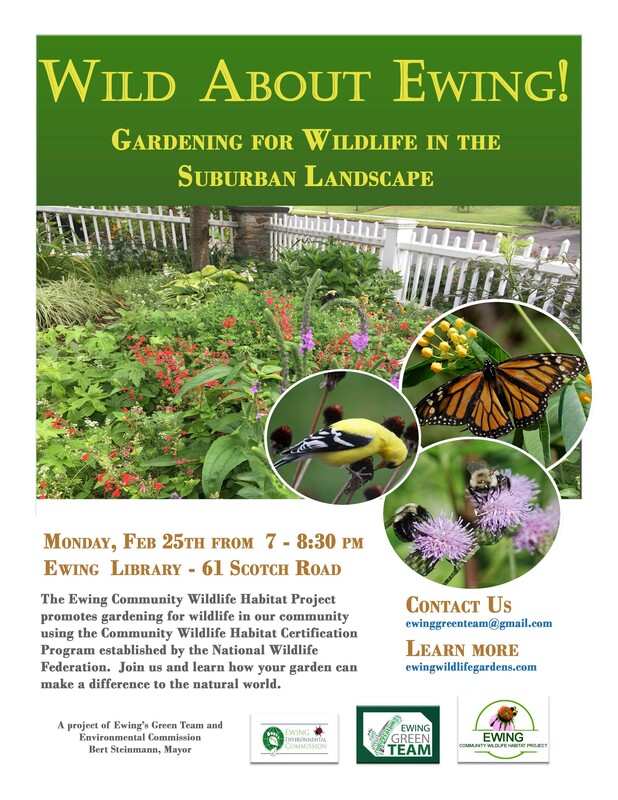 Part 1 of the series, entitled Gardening for Wildlife in the Suburban Landscape, was presented to the community on February 25th and we were thrilled to see so many interested Ewing gardeners. We hope that this will be start of a great gardening season for wildlife this spring and for the future! Wild About Ewing! will sponsor an introduction to the National Wildlife Federation’s Community Wildlife Habitat Project and how gardeners in Ewing are providing much needed wildlife habitat while getting credit for both themselves and their community at the Mercer County Library, Ewing Branch, 61 Scotch Road, Ewing on Monday, February 25th at 7 pm. Joanne Mullowney, Chair of the Ewing Green Team and lifetime gardener, and Glenn Steinberg, Chair of the English Department at TCNJ and long-term wildlife gardener, will introduce the National Wildlife Federation’s program, explain how to work the program to certify your garden, as well as how Ewing as a community is working the program. Sixty percent of the world’s wildlife populations have been lost in just over the last forty years. SIXTY percent! That is the estimate from the latest Living Planet Report published recently by the World Wildlife Fund. We have also personally taken note of the loss of local wildlife. Where are the boundless flocks of migrating birds that filled the autumn skies of our youth, the omnipresent lightning bugs that lit up our backyard summer evenings, the bug-splattered windshields from our driving trips, the butterflies, the bees, the bats…? Habitat loss from suburban expansion and industrial agriculture are key. 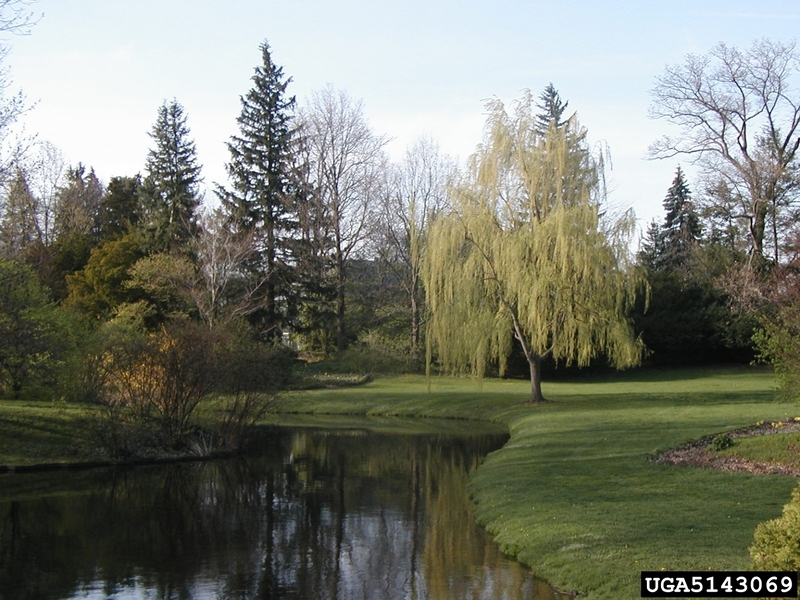 Suburban neighborhoods have exchanged healthy native habitats for vast stretches of manicured lawns which contribute little of ecological value. Industrial agriculture also plays a heavy role in unsustainable loss of habitat while also promoting synthetic chemicals and monocropping. We depend upon wildlife for critical ecosystem services and we wonder if we are destroying our planet’ s ability to support our way of life. If you too are alarmed about the extent of this crisis and wonder what you can do to ensure that your children and grandchildren will be able enjoy the natural world as we did, we invite you to follow the example of members of Wild About Ewing, volunteers from Ewing’s Green Team and Environmental Commission who work to promote wider use of native plants and sustainable gardening practices, key components required to certify Ewing as a Community Wildlife Habitat recognized by the National Wildlife Federation. To become certified in the program, Ewing needs to accumulate 250 points in certified gardens from private properties, public spaces and schools. Each garden should support our native birds, insects, small mammals… by providing the essential life sustaining requirements of food, water, cover and places to raise young. Members of Wild About Ewing are taking action for vanishing wildlife species and all Ewing property owners are encouraged to “bring nature home” on their own properties and join them in making a difference. Wild About Ewing is conducting a public outreach campaign to property owners in Ewing to encourage them and assist them in certifying their properties. 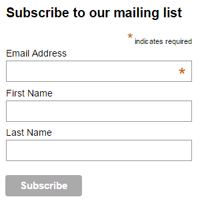 More information is available on the group’s website, http://ewingwildlifegardens.com/ and the Ewing Green Team and Environmental Commission’s Facebook pages. Carolyn Summers’ Designing Gardens with Flora of the American East (New Brunswick: Rutgers University Press, 2010) is an excellent book. It begins by laying out the reasons to garden with native plants (which the book insistently calls “indigenous plants”). Its reasons include providing habitat for birds, bees, and bugs, as well as making use of fantastic indigenous plants that simply don’t get enough play in the big-box nursery business. The book also discusses the jargon of the nursery business and the implications of that jargon for the gardener who wants to be ecologically responsible (such as how to know when cultivars and hybrids successfully function like native plants and when they don’t). 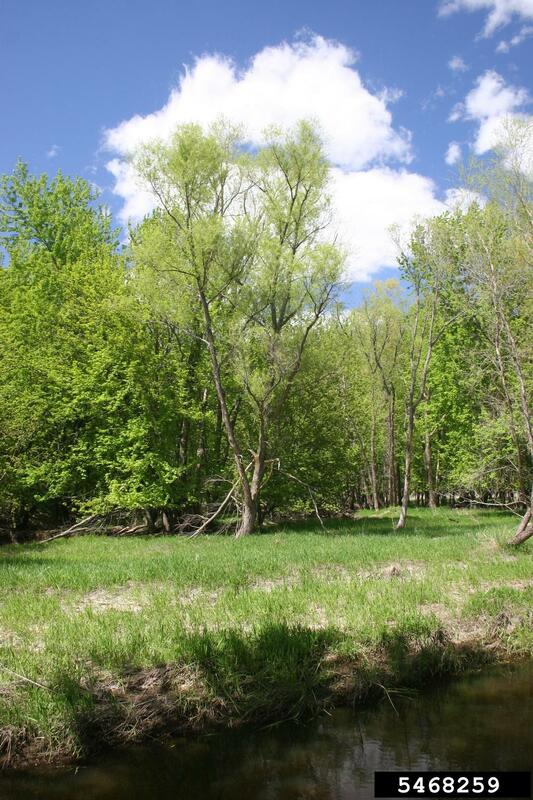 It spends considerable time talking about native alternatives to popular invasive species (such as Norway Maple, Bradford Pear, and Forsythia). The most interesting part of the book (to me) was a lengthy section on how to use native species in popular garden designs (including the street tree, traditional foundation plantings, a Japanese garden, and a cottage garden). Another section discusses how to mimic natural landscapes in your garden (such as woodlands, meadows, sandplain grasslands, heaths, and salt marshes). Needless to say, the book covers a lot of ground, and for that reason, my one criticism of it is that there were times when I’d have liked more depth and less breadth. But overall, it is an excellent book for anyone interested in incorporating more native plants into the garden. 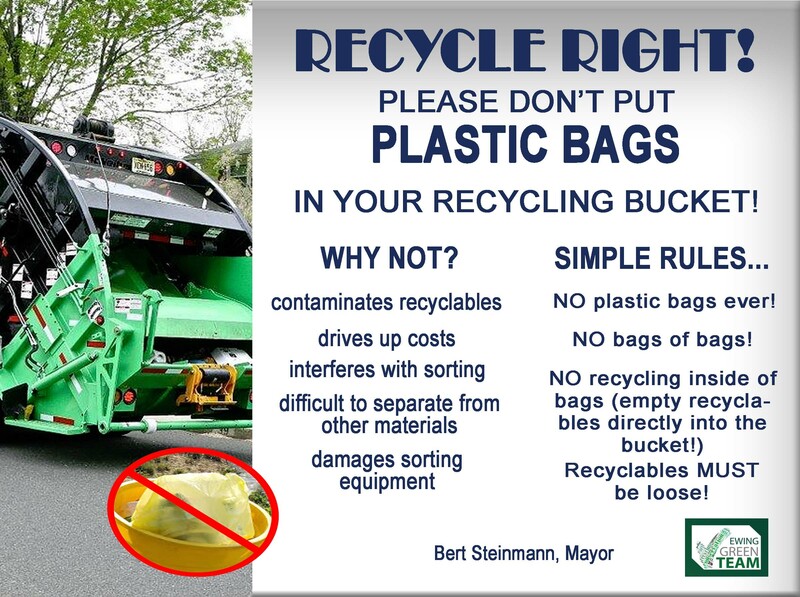 Just Say NO To Plastic Bags in Your Recycling Bin! Our annual plea for sustainable fall landscaping care has been recycled below. The first frost has come and gone and today it is sunny, humidity-free and gorgeous. We love autumn. We are finally leaving the hot, sticky days of summer behind for the cooler, more breathable days of fall. Soon the neighborhood trees will blanket the ground with their last gift of the growing season. This seasonal leaf drop can recharge your landscape and create habitat for wildlife. So, don’t treat your leaf litter as trash, but rather as the gift that it truly is to the millions of tiny creatures that are a part of our gardens’ ecosystems. Raking up and disposing of our leaves, chopping down dead flower stalks and grasses all contribute to a manicured appearance which we have been conditioned to think of as the norm. However, in nature, trees don’t drop their bounty at the curb for pick up, but rather they blanket the earth while providing a host of ecological benefits. Leaves provide an insulating winter cover in the garden for plants and those tiny creatures that sustain life in the garden. We encourage you to mulch with fallen leaves. Wherever possible, leave them to decompose where they fall in your garden beds. Or settle the leaves under the branches of your shrubs. Give it a year or so and your leaf litter will have broken down while providing mulch and increasing the soil’s water retention abilities. You can also rake out some of the leaves from the beds that are simply too much and might smother tender plants and cause them to rot over the winter. Add them to the compost pile or the leaf pile on the lawn while the rest remain in the beds. Then take your mulching mower and chop them up into small pieces. Rake up most of the chopped leaves and place them back in the garden around shrubs and plants. Now that they are greatly reduced in volume they contribute to the more manicured look that suburban mores demand. The remainder can stay on your lawn and decompose there. Do this as needed until the end of the season and the leaves will break down over the winter providing your soil with valuable nutrients all the while enhancing wildlife habitat. One incidental benefit is that of reduction of Township resources allotted to fall cleanup, saving taxpayer dollars. This somewhat messy yard contributes yet another important benefit – habitat. While not a traditional concern of the average gardener, we believe it should be. Did you know that despite its not so perfect look, leaf litter provides an important foraging space and shelter for a wide variety of birds, small mammals and insects? Also providing benefit is the untrimmed garden where ladybugs and lacewings reside in native grasses and pollinating bees settle in hollow plant stems. Butterflies and moths winter in chrysalides on the ground and baby spiders hide out amid the decaying plant stems. Birds feed from dried seed heads in winter. The dark stems and flower heads of some of our native flowers look gorgeous against the snow and nothing is more exciting than seeing our small winged friends feasting upon the seed heads. If you build it, they will come. This author no sooner established a small brush pile in a back corner in the yard and it was inhabited. Finally, don’t be in a rush to begin your garden cleanup in the spring. Wait until after several 50℉ days to begin, when spring has really arrived, allowing overwintering pollinators to move on first. You gave them a home all winter; don’t yank it away from them too soon. We ask you to adopt a somewhat messy yard and eschew the leaf disposal. Keep your leaves so that they can decompose naturally in your own yard and support the butterflies and other small insects that live in the leaf litter. To learn more about how we are promoting gardening for wildlife, take a look at our initiative – the Ewing Community Wildlife Habitat Project. During this season of renewal so essential to preserving the next generation of wildlife, we invite you to join with us and pledge to garden messy. Then put your feet up and enjoy the season. 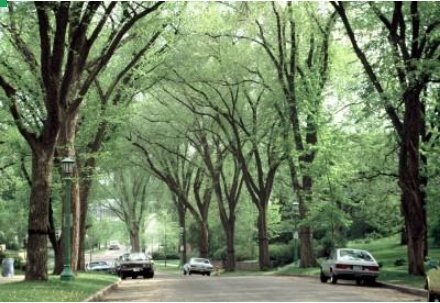 American elms were the dominant tree species along city and suburban streets across the Eastern United States through the first half of the 20th century. These graceful, towering trees with their vase-shape form created cathedral-like canopies. The elm was prized for its fast growth that provided quick shade and for its ability to tolerate poor soil conditions along city streets. Disaster struck when elm logs shipped from Europe to the United States released the European elm bark beetle, carrier for the fungus that causes Dutch Elm Disease. 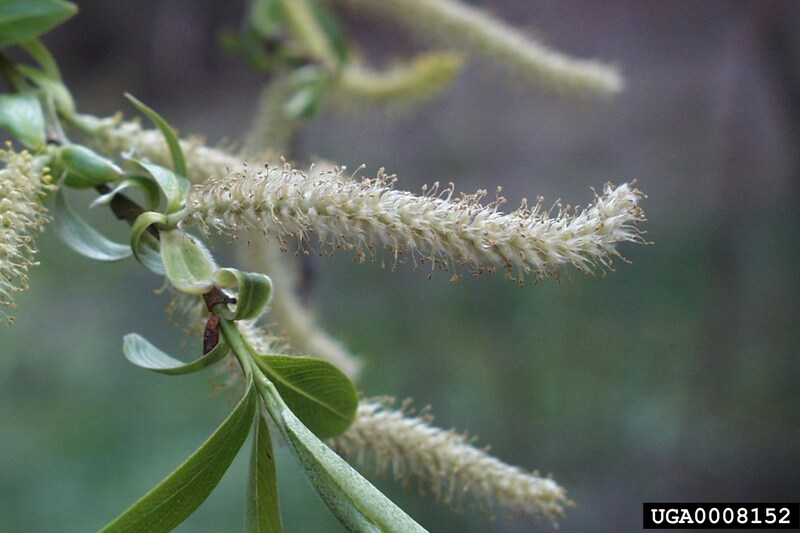 First found in Ohio in the 1930s, it spread from state to state and by the mid-60s it had killed millions of trees, leaving cities with the task of removing thousands of massive elms. The loss of the American elm as a street tree left a hole that was difficult to replace. Maples and ashes were planted in larger numbers along streets to replace the elm, but now ash tree populations are being decimated by another introduced pest, the Emerald ash borer. The search for an elm resistant to Dutch elm disease that grows in the typical vase–shaped form has been going on for decades. Three promising American elm cultivars, ‘Valley Forge’, ‘Princeton,’ introduced by Princeton Nurseries from around Kingston, and ‘New Harmony,’ are showing good Dutch elm disease resistance. On Arbor Day [April 27th] a ‘Princeton’ elm tree donated by members of the Environmental Commission and Green Team was planted along the driveway to the Benjamin Temple House at Drake Farm Park. Mayor Steinmann spoke to those gathered about the importance of planting trees in Ewing Township. Ewing’s Mayor and Council recently passed Resolution 18R-81 supporting New Jersey’s steps to return to the Regional Greenhouse Gas Initiative (RGGI), an innovative 9 state cap and trade program that has successfully reduced climate-changing carbon pollution from East Coast power plants. Climate change is a dire threat to the citizens of Ewing. The State’s withdrawal from RGGI in 2011 posed a risk to our town and region; efforts to rejoin RGGI are underway. This resolution seeks to support that goal. CLICK HERE for the full text of this resolution.